If there is one thing you can guarantee around the holiday season in Clinton, it is that you will have a lot of access to candy and sweet desserts. It is a great time of year to indulge in these things but if you are not careful, all of that sugar can cause some damage to your teeth. If you are going to enjoy some sweets this holiday season, Dr. Thomas Myers DDS reminds you of these tips to keep your teeth healthy and cavity free. – There are sweets everywhere this time of year, but that does not mean that you need to eat them every time they are available. Remember to consume these things in moderation. Try only having one dessert a day or having a smaller portion of a few items if you really want to taste everything at a holiday party. The more sweets you eat, the more you will be prone to excess plaque buildup. With more plaque, there is more of a chance of dental damage. – No matter how many sweets you eat, you still want to maintain the proper dental hygiene that is recommended. Beyond that, you will likely want to brush your teeth even more often. You may find that it is a good idea to carry a smaller toothbrush with you so you can brush after you eat sweets. By doing this, you can remove the harmful sugar from your teeth after you have had that sweet snack. – If you do not want to carry around a toothbrush with you at all times, a good alternative for removing the sugar from your teeth is to use mouthwash. This is not something you should even do in place of brushing your teeth but when you are on the move without a toothbrush and you want to help your teeth stay healthy, this is a good option for you. – Another good alternative to brushing after you eat some delicious desserts is to chew some sugar-free gum. You can keep this in your wallet or purse for quick access and the gum will help to remove some of the sugar from your mouth. It will also increase the production of saliva in your mouth which can help with removing the sugar from the surface of your teeth. – You want to change your toothbrush at home often anyway but if you are going to be eating a lot of sweets, you may want to get a powered toothbrush to help combat the sugar and plaque buildup. If you do not want to get a powered toothbrush, you may consider getting a toothbrush with triple-action bristles or diamond-shaped heads to help get into those hard to reach places. The holidays are a fun-filled time of year but don’t forget to take the time to make sure that your teeth are well cared for during all of the holiday eating. If you do have a bit too much sugar this holiday season, be sure to schedule an appointment with Dr. Thomas Myers DDS right away. 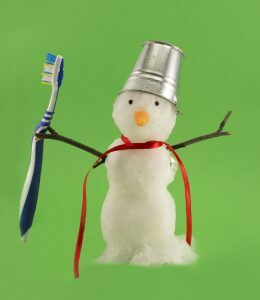 Happy Holidays from all of us at Myers Family Dentistry!